In a picture posted on his Facebook page, Ald. Howard Brookins (21st) shows the aftermath of a bicycle accident that seriously injured him. CITY HALL — Ald. Howard Brookins (21st) said he was injured in a "freak" bicycle accident involving a squirrel and will be unable to attend official events while he recovers from "multiple surgeries" to his face and upper body. "I am okay and I have been recovering in the hospital since the accident," Brookins said. "I will, however, require multiple surgeries to recover from damage to my face and upper body." 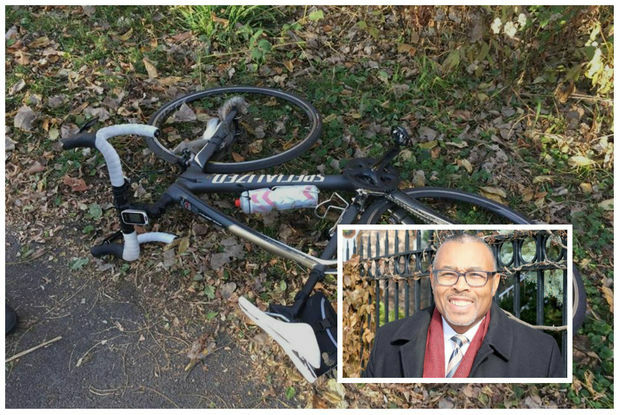 Brookins, who was first elected to the City Council in 2003, was injured while riding his bicycle Nov. 13 along the Cal-Sag Trail when a squirrel became caught in the spokes of his wheel and he was flung over the handlebars. A photo Brookins posted shows the mangled squirrel still stuck in his bicycle's front wheel. The photo is now his Facebook cover photo. Brookins was one of two aldermen to miss the vote on the city's 2017 spending plan on Nov. 16. Ald. Carrie Austin (34th), who has been ill, was also not present for the vote. Brookins posted a message on his Facebook page Sunday informing residents of his South Side ward that he would not be able to attend any ward or neighborhood events until he heals. During the City Council's budget hearings, Brookins asked city officials to do more to fight the "aggressive squirrels" that he said were eating through refuse carts in his ward and creating a nuisance — and a serious expense for city officials. Brookins said his staff will be handling requests for service in the 21st Ward — which includes Auburn Gresham, Washington Heights, Gresham, Chatham and Roseland — while he recuperates.